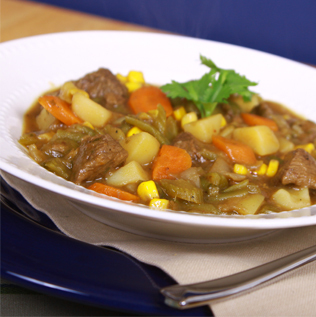 This is a fabulous recipe for thick, hearty beef stew that is on the table in just a couple of hours. Tender beef and perfectly cooked veggies that are sure to please. Combining meat and marinade in bowl or zip-type bag. Marinate in refrigerator for 30 minutes. Remove meat from marinade. Sear meat on both sides in large skillet over medium heat for seven minutes. Remove meat and set aside. Heat oil, add flour and cook until flour is medium brown. Add seasoning and stir well. Add beef broth and continue to stir so flour does not clump. Return meat to skillet; add onions, carrots, potatoes, celery and cilantro. Cook until vegetables are tender. Add green beans, corn and chilies. Cover and simmer for 1-1 ½ hours or until meat is tender; stirring occasionally. If stew is too thick, add additional water.